Bought these curtians awhile back, finally got them hung in the remodeled living room. Colors are what description stated beige, green . Our home is done in those colors and make the the area really look good. Great quality heavy grommets. Perfect length 63 long. A dynamic pairing of style and color, the Madison Park Stetsen Diamond Printed Window Curtain provides a fashionable update to any room. The printed geo diamond pattern flaunts bright colors, creating a stunning contrast for a modern update. A silver grommet top detail makes it easier to hang, open, and close this window panel throughout the day. Made from a cotton blend fabric, this window curtain has a soft and natural feel that is sure to enrich your home decor. Fits up to a 1.25-inch diameter rod. The curtains are very pretty and really match and look nice with the décor. They were a little expensive at $**/panel. I thought they would have been a little heavier. Overall, I like them and how they look. And they came in 95 inch length. The print might look slightly off in some of the diamonds but overall good buy. Made with durable materiel, this curtain was just what I needed. The metal ring holes were sturdy and the picture is very true to what the curtain looked like. Modern update in a lower rec room! I ordered the yellow color in this curtain and upon arrival, the curtains were a definite gold color. I was greatly disappointed because they didn't look like the picture. The colors were perfect for my kitchen. I tied a single panel up into a roman style valance. For any room but a kitchen, the fabric is cheap, but it made a great kitchen valance. I love these curtains!! Good quality and not heavy. The aqua is beautiful and makes my living room pop!! So fun!! Love them. Great quality and look great in my spare bedroom! The color of these werent like the picture (I got taupe). The quality was good, but I had to return. The return process was very easy, but not free. Love the colors and that it came in the shorter length! 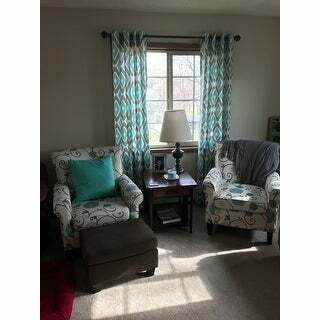 "Feb. 21,2016: sueraynes, a customer had asked if these curtains were a blue aqua or a green aqua and your answer was that they leaned more towards green. January 19, 2016: Janet L. wrote in with basically the same question and you said that the background was ivory with a blue and blue-ish gray diamond pattern. I'm taking it that the Aqua color is more blue than green, am I correct in saying that? I realize the colors are more vibrant than our screens show. " The colors are Taupe and Aqua, in our opinion. Color is open to interpretation. Please remember, due to the difference of monitor colors, the colors on some of our items may vary slightly. Thank you. "I am worried about whether or not the colors will go well when I actually pair them with my room? I tried to look up your return policy but do not understand. Can I return if they do not work? Do I get a full refund? Do I pay for return shipping? Thanks!" Hello taykerk, items returned in new or unused condition with all original materials included with the shipment are eligible for a full refund. We inspect all returned items and award a partial refund for opened or used products. If the return is a result of our error or defective product, we will refund the full cost of the merchandise and shipping charges. If the item is not damaged or defective, a small shipping fee will be charged. For more on our return policy: (https://help.overstock.com/app/answers/detail/a_id/1). Thanks for shopping with us! "Are these more of a blue aqua or a green aqua. They look really blue in the picture." Hello sueraynes, we try to represent the colors of our products accurately. Unfortunately, due to the difference in monitor colors we cannot guarantee that the color will match exactly what you see on your screen. It leans more towards green. Thank you for shopping with Overstock! Hello stephofms, this window panel is not lined, but it does provide privacy and is not see through. Thank you for shopping with us. "Is the aqua light or dark. Moor blue or green. How off is the white"
Hello SHARON L., based on customer reviews, the colors are more vibrant. 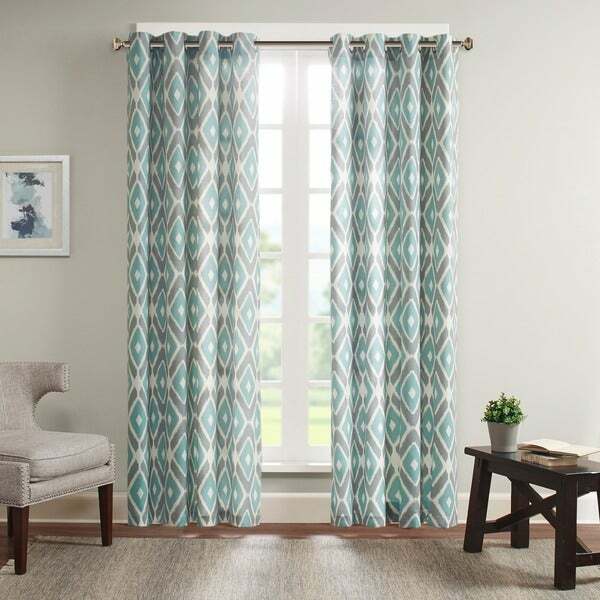 The curtain panel has an ivory background with grey and blue-ish grey diamond accents. I hope this info helps. Thanks for shopping with us! How many panels with each order? "What is the thickness of these curtains? Are they sheer? Light Filtering? Heavy Cotton? Blackout?" Hello Ashley G, these currents are a 1/8 inch thick blended polyester, cotton and rayon fabric. It does offer some privacy as they are not sheer but they are also not black out. Thank you for shopping with us.